I sit outside the open door so I can hear the coffee perking. Ooh, that sun feels good! Spike and Bridget agree with me. It’s warmer outside the BLT this morning, than inside. I sprinkle more birdseed on the ground under the ironwood tree. I fix my coffee and settle into my camp chair. I love the little Black-Throated Sparrows with their white facepaint and black bibs. A flock of eight of them visits our campsite every day. They all seem to live in harmony. Sometimes one will run over to another and touch beaks. They move so quickly I can’t tell who’s feeding whom. They swoop in with much ado, flapping wings at each other, bullying, and hopping about in hormonal hissy-fits. Usually they drive off the sparrows. And can they chow down! Geez, I’m going to have to buy more seed. It’s always a pleasure, however, to see Mr. and Mrs. House Finch arrive. They like to dine at the hanging feeder, getting right inside it. Rarely do they join the hustle-bustle of birds on the ground. Their chirping is a delight to hear. I notice a Cactus Wren perched at the very top of “our” saguaro. He’s facing the sun singing his heart out, but he doesn’t visit the happy throng enjoying breakfast before me. 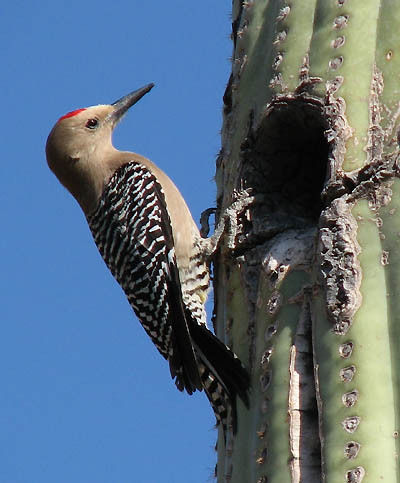 The Cactus Wren flies away, and a Gila Woodpecker claims the saguaro. He clings to its side among the thorns. Sometimes he drinks from the hummingbird feeder. 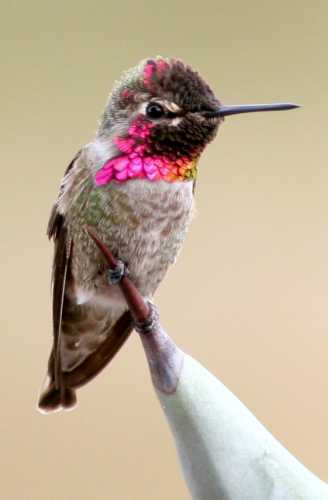 Last but not least are the Anna’s Hummingbirds. When positioned toward the sun, their crown and neck glow irridescent pink. And their aerial maneuvers make the fighter jets that occasionally fly over from the missile range seem slow and clumsy! My thoughts turn to mundane matters. While I watch the birds, I take stock of my situation. I’ve got almost-full propane tanks and water tank, and near-empty waste tanks. (I took care of those tasks the day before yesterday.) It’s almost laundry time again. And I’ll need groceries again soon. Buying groceries at small stores in small towns really increases my outlay for my food, for the crew’s food, and for daily-living sundries. I mull this over until I see a way I can cut down on my spending at mom-and-pop groceries with their high prices. After almost six months, my pattern for full-timing is in better focus. I’ll travel in spring, summer, and fall, but in the winter, I’ll camp in one general location in the desert. I may have to move to keep within the 14-day limit, but I won’t go far. Winter will be my time to re-discover the desert I’ve come to love, renew my spirit, and re-evaluate my life choices. The bright yellow blooms of the Brittlebush cheer up the drab roadside. Back to the groceries . . . In late fall, on my way to the desert, I’m going to stock up on groceries at Wal-Mart. Really stock up. Buy by the case. Why not? I’ve got plenty of room in the PTV to store non-perishables, and I won’t be doing much driving so the weight isn’t a problem. Also, I can always hide cases or milk crates of canned goods under the BLT. Saving money makes this old bird sing! Cheep-cheep! The downside is fewer of my dollars will go to small business, which I would like to support. Oh well, I’ve got to be prudent with my money. Speaking of spending or not spending my money . . . Yesterday I checked with my credit card company and found my accumulation of points amounted to $79! I jumped online to Amazon.com and spent it in record time. I like to buy fun stuff with points-money. It balances the miser in me. Last time I used my points to buy the blue patio mat for $65. This time I ordered acrylic paints, paint brushes, and other artist supplies to be sent to the Ajo post office through general delivery. I love getting packages! What fun! This entry was posted in Simple living and tagged Ajo, Arizona, birds, desert, fulltiming, Sonoran Desert. Bookmark the permalink. It’s exciting to me and helpful to others to see you evaluating your lifestyle and identifying ways to be more cost effective. You’re still going to be shopping at the small businesses for the perishables and propane, dump and water fees and the occasional deli meal so you’ll have a good balance of being very cost conscious as well as supporting the local economy. Sort of like your Amazon points, you’re saving up “spending points” in the winter so you can use it for traveling during the spring, summer and fall. That will come in handy when it’s hot outside and you need the ac on to be cool and comfy in the Casita. It can get hot in other places besides Texas in August. Even if you didn’t take the bird pictures, the narrative with them is fantastic. Glad you’re enjoying the peace, quiet and birdy entertainment. I like the way you elaborated on this post. Great analysis! If your writing is any indication, you have a well-organized mind, Reine! Organized mind – only sometimes. I just like to see folks making good decisions and enjoying today while making plans for tomorrow. To me, planning the trips is almost as much fun as going on them. You spent soooo long saving and planning for now, it’s good to see you reaping the benefits of the planning. One step closer to hitting the road, again. I found that I can find vets who will renew my pups food prescription by putting a zip code on their site. If I’m really isolated and can’t find one, they will ship one to me, but I’m hoping to avoid this (cost). I’ll stock up with 4 big bags before I leave and always make sure to have one available so if I have to travel to get a few, I will. Glad you’re enjoying the good weather. Traveling three out of the four seasons sounds like a good plan. I never liked camping in the heat. I know what you mean about the birdcalls. I use to have a record (now that’s a long time ago) of bird songs. My 5th graders did reports on birds and I played the record in class. They loved it! I wanted to put a button with a birdsong in this post but I was afraid I’d give my blog a stroke. I’m impressed with your arrangements for your dogs’ food. You’re going to be well-prepared for the road. Those kinds of plans help avoid worry and unnecessary driving. WOW Sue, you REALLY dated yourself…records…heheheheee. Wonderful post for today. Thanks. Thanks. I really enjoyed putting this post together, especially researching the birds at the site I posted. These are great bird pictures Sue especially the humingbird. Wish I were sitting right next to you. I love to sit and just watch. No talking. No reading. Just watching.and breathing and smiling. I’m so glad you’ve found a place you love that you want to come back to for winters. My situation is in flux right now and should I end up alone, I can easily see myself trading in my 34′ class A. Yours is a great model full time model with your Casita and PTV. Your description of sitting and watching is what some people call “sitting around doing nothing.” It’s a lot more than that, isn’t it. Thanks for saying my van and Casita are a great model for full-timing. I’m so proud of both of them. Having a vehicle that provides plenty of storage space makes life much easier. The PTV does that, plus it has plenty of power, has good road clearance, is shiny, . . . . I could go on and on. And the Casita suits me to a T! The Crew certainly look relaxed and happy soaking up the sun. Loved the bird photos – thanks for the reference. I went to the site and looked at even more. I am so dumb about birds but I love to watch them. Sounds like you have a good plan put together for when to travel and when to stay put. You’re getting all the kinks worked out!! That site is a comprehensive reference. 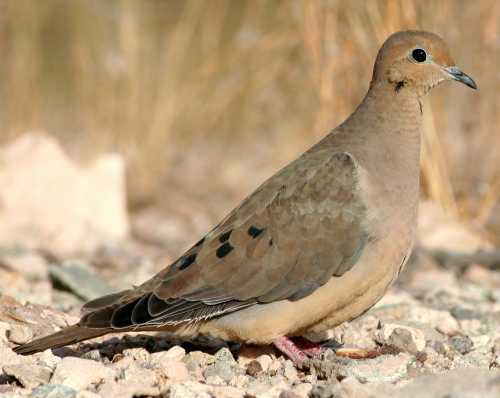 It makes it easy to identify the birds, and it has great photos of birds and other animals of the Sonoran Desert. I’m glad my post brought some birds to your northern Ontario day. Great post. Your are my new guru of frugalness. Namaste! Hi, Page. . . Gee, I’ve never been called a guru before! Remember our dinner in NM? Country fried steak? We are home now, and for the last 3 months, we have been primary caretakers for my sister who has lung cancer. It’s cold and snowy today, but I see 14 cardinals on the deck plus a myriad of others. We had planned to be gone most of the spring, but we are needed here. We are planning a long trip to upstate NY in July if all goes well. Now is our usual time to spend in Cajun country. Enjoy the desert for us. I was thinking of you both today as I looked at the photo of Coyote Creek State Park I have on my cellphone! I’m sorry to hear your sister has to deal with cancer. God bless all of you. I remember how cardinals at the feeder used to brighten snowy days for me, too. Upstate New York near the Vermont border is where I grew up! Wade or go tubing in the Battenkill for me . . . . It’s perfect in July. Warm, warm wishes to both of you and your families. I will be in UPSTATE New York July 18-28th I want to tube down the Battenkill again!!! Sue, your bird photos were so beautiful and great narrative with each one! Thanks for hanging in there gal, we love your posts! Just so it’s absolutely clear to everyone . . . I didn’t take those photos! I wish I had the talent and the equipment to take great bird pics. You have the talent, you just need to decide if you want to shake loose with a thousand bucks or more or $300 and up for used equipment on ebay! Hey, you can even get it on Amazon! Hey, Bob! Great to see you’re blogging again! I’m intrigued by the oven. You wrote a very thorough review. Only one question for you . . . What do you put the gas burner on? I was wondering about propane use. Gee, this might be my next Amazon-points purchase! Thanks! I have to put it on high, to get 350 degrees on the thermometer in the oven door. Seems to work well. I cooked a thick roast with potatoes and carrots today for 2 1/2 hours, and it came out fine. Used a bread loaf pan. You have to check it doesn’t dry out, and there’s plenty of room around the pan for air to circulate. IE, cook one thing at a time, and don’t crowd the oven. A regular oven circulates air through the walls. This thing circulates air around the food. Don’t know how much gas it uses. No more than a regular gas oven. It does heat up the kitchen a bit, but no problem if you leave some cross ventilation working or the door open. Don’t know about the casita, as it’s smaller and may heat up more. Especially if your normal sitting space is right next to the stovetop. Good news is that when you turn it off it cools very quickly. I also made a cake today, just because I could. Good info, Bob. Thanks. Now if I were taller and had your frame, I could eat all those carbs. I see by your weather gadget that it is 77 degree’s there right now. Wish I was there soaking up some of that warmth. It’s 16 degree’s here, hasn’t been a really bad winter but still not happy with that temp. The small fridge and freezer is big enough for me, and that may be because I don’t eat much meat. I don’t think two meat-eaters who boondock would find it adequate. As for the weather gizmo, I notice that it often shows the temp. a few degrees lower than it is here and probably than what it is in Yuma, too. It’s more like the in-the-shade temperature. I wish I could take photos as gorgeous as these bird pics! I bet Geri could. Click on the link at the end of the post. There are a lot more photos there, not only of birds, but plants and animals, too, that live in the Sonoran Desert. I’m going to look up some flowers tomorrow. Love reading your blog. I worked on our Ajo pictures today. Wish we were there. Such a beautiful place. How is your campsite landscaping going? Or are the birds and their antics sufficing as the main decoration. No need to improve on the beauty of your surroundings! I can just imagine how my blog posts make you wish you were here. You enjoyed your desert hikes and the sunsets so much. No, I’m not landscaping. I look at what’s worth looking at and try to ignore what humans have done. Nice to see the birds, some familiar to further north. Stocking up is definitely the way to go if you have the space. I like your interpretation . . . “14 days from when they find you.” It’s true! Speaking of groceries in Ajo, have you stopped in to the little tortilla shop in town? Tortillas so fresh they are still warm in the bag and 2.50 for a dozen monster flour ones isn’t bad at all. Delicious! No, I haven’t, Brent. Sounds really good. I don’t know where it is. I don’t want to go to the wrong place. I am a birder and enjoyed your photos . I have actually birded in Cabeza Prieta Refuge. You just have to know when they’re using the the bombing range!!! I figured I have a reader who is a birder. So I was very careful with my identification! Wonderful post and photos of your beautiful feathered visitors today, Sue! I’m a birder so I especially enjoyed it. We decided long ago that birding is a good focus to travelling since there are birds everywhere! Big news! We bought a used Casita in Texas today! I credit you and your blog with helping us decide on a sweet little Casita. 😉 Thanks, Sue. I can’t wait for the adventure to begin! CONGRATULATIONS, HAZEL!!! I wish you many wonderful adventures! No, I don’t know Jon Katz. I’ll follow that link. Thanks. Happy bonding with your little egg . . . If you go to Amazon through a link on my blog, all proceeds go to the fight against Breast Cancer. Hi, Daryl . . . I wish I’d known about this yesterday. I’ll try to remember in the future. I like shopping at Amazon.com and fighting cancer, too. Loved your blog today, as always. The bird pictures were a welcome sight, with winter temperatures still upon us here in the midwest. Couldn’t help but focus on the artist supplies you’ve ordered and wondering what your subjects will be. What a great way to relax! Don’t be afraid to show your works of art…… if it pleases you to do so. I’m not sure what I’ll paint. I’ll play around with the paints and see where that leads me! Nice entry. I am hoping to become an avid birder when I retire (104 days and counting!!) and move to North Carolina. Can’t wait to have the TIME. On BLM land, do they have something that resembles a parking space designated or do you just drive up and park wherever you want to? Whether you’re along the NC coast, in the mountains, or somewhere in between, you’ll see a great variety of birds . . . with the time to enjoy them! I’m happy for you. In my limited experience, BLM camping means you follow roads (dirt or gravel) and then the narrower offshoots of those roads. When you see a place where someone has camped before, you park there. There isn’t a sign at campsites. I think it’s best not to make a new campsite, unless you’re absolutely sure your parking won’t adversely affect the area. An example would be driving into a meadow, crushing and killing grass and flowers, or parking where animals gather for water. Where I’m parked there is a fire ring someone made of rocks. Love the pictures!!!! So glad to hear about the painting supplies…I hope this means you are going to start painting again. Sue, there is a website I like to go to by DesertUSA. Click on the “Plants” and the drop down will give you “wildflower reports” of what is currently blooming in the various deserts of the southwest. There are often pictures too to help identify. Thanks, Emily. I’ll add it to my Favorites. I got to say that I am really enjoying reading about your escapades. I went back to day one and I am now up to 9/2/11. I can’t wait to catch up and read your current posts on what is going on. I read with interest because you are doing what I have long thought I would like to try. Like you, I too work for the State of GA. I have about 7 years to retire. I may work an additional 5 years to draw more retirement. So I thank you for blazing the trail. I look forward to living through your adventures vicariously. Welcome to my blog and congratulations for sticking with it all the way to September! As you know, I went through some years of waiting. The blogs of fulltime vagabonds helped me to realize my dream was possible and within my reach. Reading their blogs kept my eyes on the goal. I hope mine does the same for you. Sue- I wanted to log in to your last entry because I was hoping to hear from your solar mentor Mick! (it’s a technical thing) No, not totally, but I also enjoy seeing all the neat stuff you put on your site.Congrat’s and all that stuff! We also enjoy comments from Chuck and Geri. K and I have something in common with…we got to meet you! Just a freindly note Cheers BR, K and kids. Of course she’s safe and warm, she’s gotATTITUDE!!!! !